1. The most remarkable phenomenon is the decline in the President's approval. One would need to display a much longer series to show this fully, but I think it's probably not too bold to say that Cavaco is now the most unpopular President Portugal has ever had since polls have measured this sort of thing regularly (since the mid-1980s). The fact that he is now as popular (or, better put, unpopular) as the two main party leaders is, I think, particularly striking, given the nature of his office. 2. In spite of the decline in the former Prime Minister Sócrates' popularity, PSD never had, until Passos Coelho, somebody who could match him. 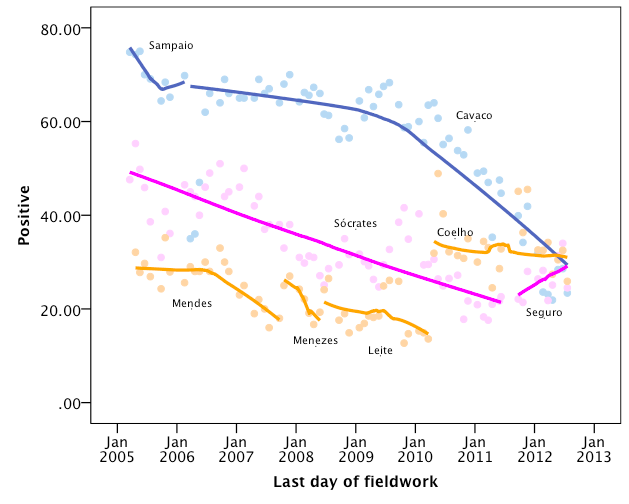 Furthermore, Passos Coelho started at a level well below the popularity of Sócrates at the beginning of his own term. Having said that, the political and economic circumstances are, of course, dramatically different from those in 2005/2006. 3. 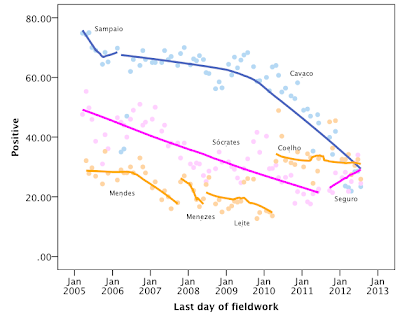 A good piece of news for Coelho is that his level of approval has stayed relatively stable until July 2012, unlike his party, which has suffered a decline in voting intentions. Of course, we'll have to see how the horrifying political summer the government has been experiencing will play out in the next polls. 4. Seguro, the new PS leader, has been rising, although having started from very low levels (for PS leaders' usual standards).